In my continuing quest to minimize what electronics I travel with, cords and power supplies are a big target. I thought I had found a great compromise with the iGo Juice system which allowed me to charge my laptop and gadgets with on power brick. Unfortunately it does not support the Sony VAIO P and although the VAIO P's power brick is small, jamming all of the required cables in my accessory case can be a pain. After reading some posts on the pocketables.net VAIO P forum, someone mentioned using an Apple style AC plug rather than the AC cord. This is a great solution since it takes up less room than the cord, but Apple charges $39 for a set of 5 international plugs (a pretty ridiculous $7.80 per plug). I found a knockoff on eBay for $11 which includes a USB power supply. It works well and the US plug folds to save even more room. The eBay Apple World adapter knockoff kit with the USB power charger (left). 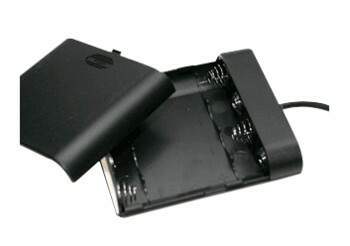 The US foldable plug is attached to the VAIO P power brick. For now I have no need for the power charger but you never know. Bottom line the price was right. The BMW snap in adapter concept which allows you to swap it for different phones is excellent, however they never envisioned the iPhone's width when they designed the E53 X5 eject box (snap in adapter fits into the eject box). This means that the iPhone snap in adapter (part no 84 10 9 182 792) fits into the eject box, however the iPhone is to wide to fit into the combination snap in/eject box. The only option is to trim the eject box's side walls as reported in this X5 forum post. The problem is that trimming the walls can be a tricky process which I was not comfortable attempting, however Matt at 2point5 (the makers of the spec doc) has the required skills and equipment to do a great job. 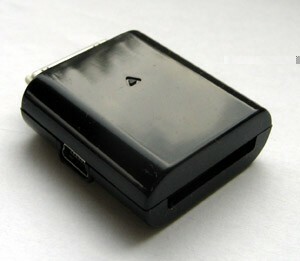 The customized eject box with the snap in adapter installed. The red arrow points to the trimmed side walls. The eject box, snap in adapter and my iPhone 3G installed in my X5 center console. The snap in adapter charges my iPhone 3G. It is too bad the iPhone does not have an external antenna to make use of the X5's cell antenna. The iPhone connects via BMW's 13th generation ULF Bluetooth unit (part no 84 10 9 154 358) which works perfectly. 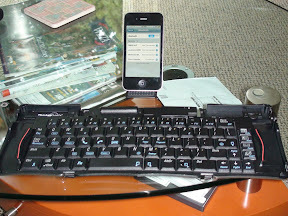 This year's Christmas project on my X5 was to upgrade the integration between my iPod 5G and iPhone 3G. I originally installed a Dension interface to my iPod 5G then the iPhone, although it provides basic iPod functionality, the NAV screen integration was less than optimal with scrolling text which changed character size based on the length being displayed. I think the unit was better suited for display on the ODB display below the instrument cluster or the non NAV radio. Dension went out of business and Dice became the leader in 3rd party iPod integration, however Dice does not provide any real advantage over my original Dension other than the text scrolling issue is resolved. The cost, since you need to purchase the Intravee II and an Alpine AI-NET device. The Alpine AI-NET adapter I needed does not provide the USB 5V charging voltage required by the iPhone 3G and newer iPods. The fix for this issue is to purchase a Ridax charge converter. I would need some integration work between the snap in's dock connector and the Intravee/Alpine solution. The iPhone is hidden from view and is not easily accessible. The one advantage with the snap in adapter is that it charges the iPhone 3G. I went ahead and purchased the iPhone snap in adapter to see how much of a deal it would be to modify. As I was doing research, I came across the spec dock from 2point5. The spec dock is an iPod/iPhone dock which replaces the ashtray and is clearly the most elegant solution out there. Matt Turner over at 2point5, the makers of the spec dock mobile iPod solution, provided me a spec dock which has a cable with a female dock connector which I could connect directly to the Intravee/Al-NET/Ridax charge converter setup. Since I had purchased the snap in adapter and did not want it to go to waste, I decided to use it as an alternate charging dock when I am using my iPod 5G 60GB (contains my entire library) in the spec dock. Matt agreed to trim out the walls of the eject box so that I could fit the iPhone in the snap in adapter. I can highly recommend the spec dock and working with 2point5, LLC for any custom work. They delivered everything as promised and are very easy to work with. The total for this project came to $561 (not including the snap in work), not inexpensive but well worth it for the seamless integration. Part 2 will describe my installation.